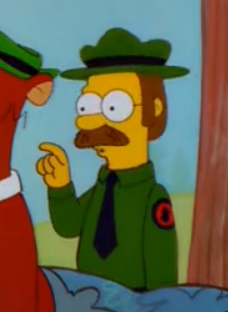 Ranger Ned is a ranger in the forest. In Homer's dream, Homie the bear was swiping picnic baskets with his son Bart-Bart. When Ranger Ned told Homie to put the basket down, Homie mauled Ned. Modified on February 4, 2016, at 03:17.